This offer is for all the coffee lovers! 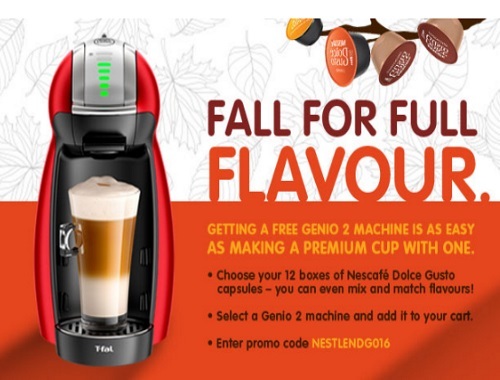 Get a Free Nescafe Dolce Gusto Genio 2 Premium Coffee Machine when you purchase 12 boxes of Nescafe Dolce Gusto capsules! Add the Genio 2 machine to your cart and enter the promo code NESTLENDG016 at checkout to get $129 off your order! Shipping is free. Offer is valid until December 31 2016 or while supplies last.